Welcome To Bingley Roofing Contractors Ltd.
Bingley Roofing Contractors Ltd has been involved in the installation and maintenance of fascias and soffits for over 30 years. This includes repairing, maintaining and installing new or replacement fascias and soffits. We are happy to replace fascias and soffits with low maintenance UPVC products. Or, alternatively we can install traditional timber fascias and soffits. It is common to combine this service with our guttering services and we will gladly provide free quotations for any works of this nature. A modern alternative for flat roofs. A 'Topseal' fibreglass roof carries a 20 year guarantee. Our roofers are trained and accredited by Topseal which is the only way to be able to provide this system of roofing. Topseal fibreglass system is specially formulated for roofing purposes and is only available to accredited companies such as Bingley Roofing Contractors Ltd.
A 20 year guarantee gives you complete piece of mind. compared to the older method of felt with bitumen which carries a 2 year guarantee. Fibreglass roofs are maintenance free and so durable that you can create patios verandas etc and walk on them without effecting the guarantee. Felt roofs consist of two or three layers of sheet felt materials that form a dense, voidless and impermeable barrier. Bingley Roofing has over 30 years experience in all aspects of guttering. This includes repairing, maintaining and cleaning all types of gutters, valleys and gullies. Also installation of new guttering, including wooden gutters, upvc gutters or even the more traditional cast iron gutters. We have facilities for preparing and painting gutters offsite, and we provide and install all the relevant fixtures, fittings and fall pipes etc. We are approved contractors of Topseal and GRP Roofing which incorporates a 25 year, manufacturers guarantee, so you can feel safe with us. Bingley Roofing Contractors Ltd have experienced staff that are able to install a wide range of size, finish and design of Velux windows to meet a client's specific needs. Velux windows can be installed as replacements of existing skylights, or as new installations into a pitched roof area and even into flat roofs. Bingley Roofing Contractors Ltd has over 30 years of experience of carrying out both re-roofs and general slating and tiling works, such as general maintenance. We cover all types of modern concrete tiling through to the traditional craft of Yorkshire stone slating. This involves all aspects of roofing that is required within re-roofing, such as lead work, chimneys, valleys, etc, using the highest quality of roofing materials. We also carry out general repairs and works to all specifications of roof, both tiled and slated, such as realigning slipped slates/tiles and replacing broken and missing tiles, etc. Bingley Roofing Contractors Ltd have, for over 30 years worked with sheeting and cladding. This application has been used in domestic, commercial and industrial applications. A wide range of sheeting materials and profiles are available such as plastic coated steel, fibre cement (asbestos replacements), single skin, double skin insulated etc. We undertake repairs, maintenance and new installations. We can offer an over clad system to provide a modern look to your property and gain the benefit from added insulation and superior weather protection. Often a more cost effective solution to carrying out a re-roof. A plastic coated steel clad roof will require less maintenance than a similar slated of tiled roof. Bingley Roofing Contractors Ltd can provide an emergency call-out service in the unfortunate event of storm damage. We can carry out permanent or temporary repairs to ensure the roof is watertight and safe. Our organisation can organise a site inspection and subsequent report to provide clients comprehensive information to help process a roof damage claim with their insurance company. We understand that storm damage can cause great distress to you as home or business owners. It is our job to see you through this period and reach a resolution that you will be very happy with. 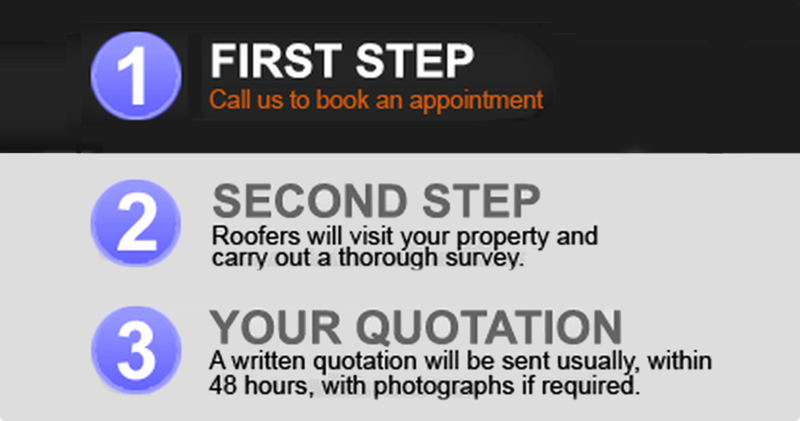 Bingley Roofing Contractors Ltd has over 30 years of experience of carrying out both re-roofs and general slating and tiling works, such as general maintenance. We cover all types of modern concrete tiling through to the traditional craft of Yorkshire stone slating. This involves all aspects of roofing that is required within re-roofing, such as lead work, chimneys, valleys, etc, using the highest quality of roofing materials. We also carry out general repairs and works to all specifications of roof, both tiled and slated, such as realigning slipped slates/tiles and replacing broken and missing tiles, etc. Free of charge, no obligations quotations can be carried out for turning slated roofs, re-roofing in tile or slate on existing roofs, or working from plans for extensions and new builds. We can install wooden and UPVC fascias, soffits, guttering and cladding. We also have vast experience repairing or installing new cast iron guttering. Bingley Roofing Contractors Ltd are approved contractors of Topseal, GRP roofing, which incorporates a 25 year, manufacturers backed guarantee. Please enter your details in the form below and we will get back to you.